As developers, one of our top priorities is to build reliable systems; this is a core pillar of the AWS Well Architected Framework. A common pattern to fulfill this goal is to have an architecture built around loosely coupled components. Amazon Kinesis Streams offers an excellent answer for this, as the events generated can be consumed independently by multiple consumers and remain available for 1 to 7 days. 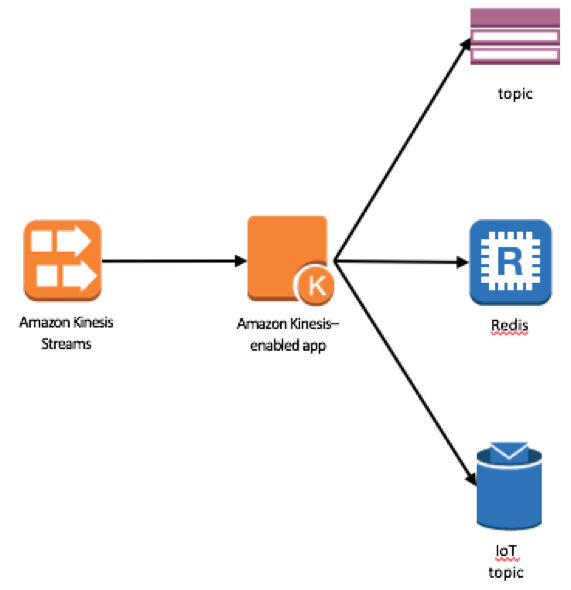 Building an Amazon Kinesis consumer application is done by leveraging the Amazon Kinesis Client Library (KCL) or native integration with AWS Lambda. As I was speaking with other developers and customers about their use of Amazon Kinesis, there are a few patterns that came up. This post addresses those common patterns. Amazon Kinesis has made the implementation of event buses easy and inexpensive, so that applications can send meaningful information to their surrounding ecosystem. As your applications grow and get more usage within your company, more teams will want to consume the data generated, even probably external parties such as business partners or customers. These cases may lead to a depletion of the resources available in your stream, and that could potentially impact all your consumers. Avoiding these scenarios could be done by scaling-out your streams, and provisioning for peak, but that would create inefficiencies and may not even fully protect your consumers from the behavior of others. What becomes apparent in these cases is the impact that a single failing consumer may have on all other consumers, a symptom described as the “noisy neighbor”, or managing the blast radius of your system. The key point is to limit the impact that a single consumer can have on others. A solution is to compartmentalize your platform: this method consists of creating multiple streams and then creating groups of consumers that share the same stream. This gives you the possibility to limit the impact a single consumer can have on its neighbors, and potentially to propose a model where some customers have a dedicated stream. 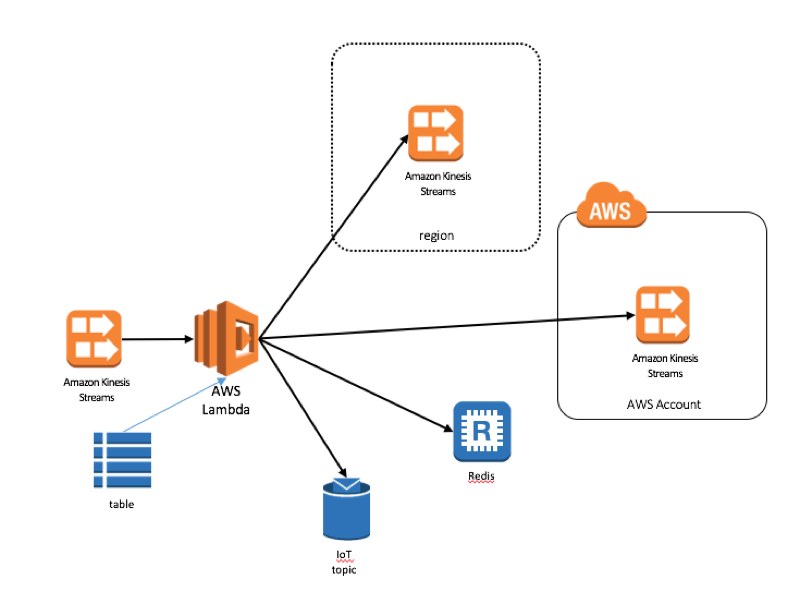 You can build an Amazon Kinesis consumer application (via the KCL or Lambda) that reads a source stream and sends the messages to the “contained” streams that the actual consumers will use. There are many other cases, but the core need is having the ability to get the data from Amazon Kinesis into other platforms. The solution for these use cases is to build an Amazon Kinesis consumer application that reads a stream and prepares these messages for other services. The final request I have seen is the possibility to process a stream from a different AWS account or region. While you can give access to your resources to an external AWS account through cross-account IAM roles, that feature requires development and is not supported natively by some services. For example, you cannot subscribe a Lambda function to a stream in a different AWS account or region. 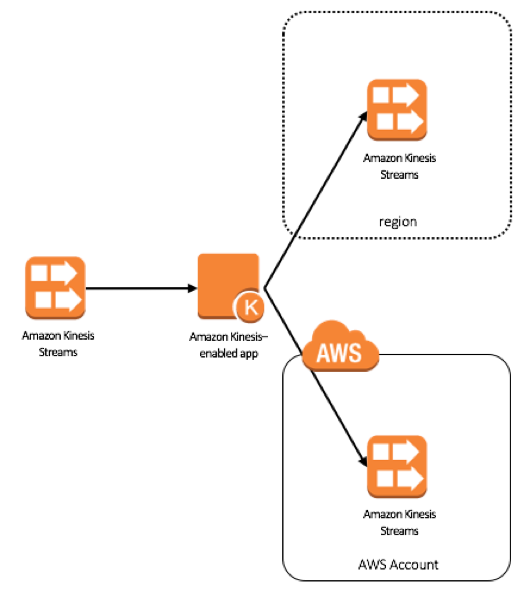 The solution is to replicate the Amazon Kinesis stream or the events to another environment (AWS account, region, or service). This can be done one time through an Amazon Kinesis consumer application that reads a stream and forwards the events to the remote environment. 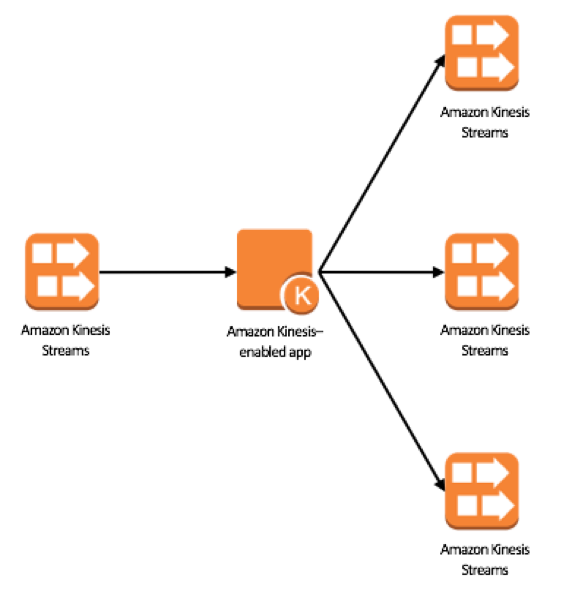 These three major needs have a common solution: the deployment of an Amazon Kinesis consumer application that listens to a stream and is able to send messages to other instances of Amazon Kinesis, services, or environments (AWS accounts or regions). In the aws-lambda-fanout GitHub repository, you’ll find a Lambda function that specifically supports this scenario. This function is made to forward incoming messages from Amazon Kinesis or DynamoDB Streams. It relies on Lambda for a fully-managed environment where scaling, logging, and monitoring are automated by the platform. It also supports Lambda functions in a VPC for Amazon ElastiCache. Depending on the target, some other properties are also stored. The function can also group records together for services that don’t initially support it, such as Amazon SQS, Amazon SNS, or AWS IoT. Amazon DynamoDB Streams records can also be transformed to plain JSON objects to simplify management in later stages. The function comes with a Bash-based command line Interface to make the deployment and management easier. As an example, the following lines deploy the function, which registers a mapping from one stream (inputStream) to another (outputStream). There are many options available for you to forward your events from one service or environment to another. For more information about this topic, see Using AWS Lambda with Amazon Kinesis. Happy eventing!